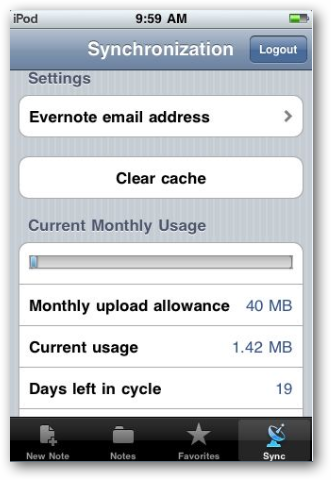 Would you like to use Evernote anywhere without having to upgrade to a Premium account? Premium Evernote subscribers can sync whole notebooks offline on iPhone, but here’s how you can get your most important notes anytime on any Evernote account. Evernote is one of the best notetaking solutions since it makes it simple to keep everything you need to remember stored on your PCs, mobile devices, and the cloud. While the desktop Evernote apps let you save all of your notes offline on your device for free, most of the Evernote mobile apps can only access your notes when you’re online. 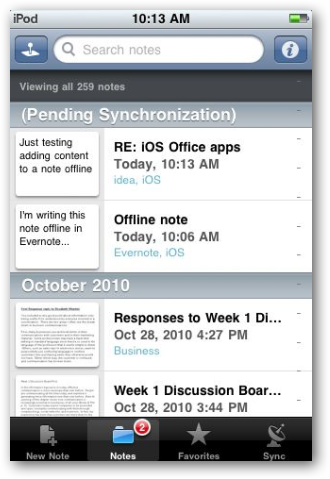 Evernote for iPhone actually does support syncing full notebooks offline on your device so you can access them from anywhere, but this feature is only available to Evernote Premium Subscribers. 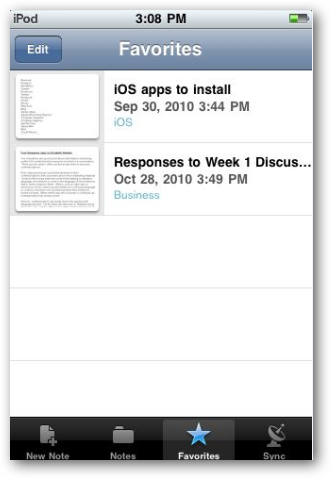 The good thing is, Evernote for iPhone does let anyone keep their most important notes offline. This is especially exciting for anyone with an iPod Touch or an iPhone in an area with limited data connection, so let’s see how this works. When you first install the Evernote app, you’ll of course need to be online to activate your account. 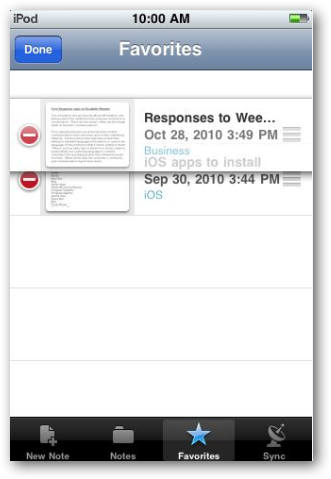 Then, as you browse through your notes, Evernote will cache thumbnails of your notes on your device, so even if you’re offline you can still browse through them. If you open a note, you’ll still be able to view it even if you’re offline later. Unfortunately, though, it’s difficult or impossible to know which notes are actually cached and ready to view offline. 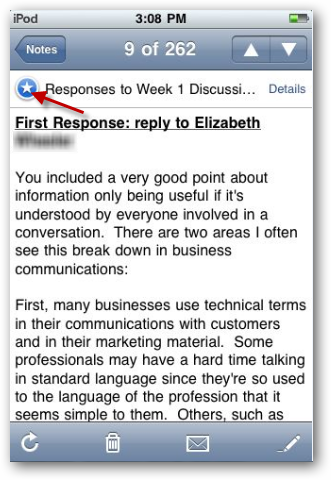 To make sure your important notes are saved offline, you’ll need to use the Favorites feature. You may have noticed a small star in the top left corner of your notes; this is the favorites button. When reading or editing a note that you want to keep offline, just press that button to save it as a favorite. 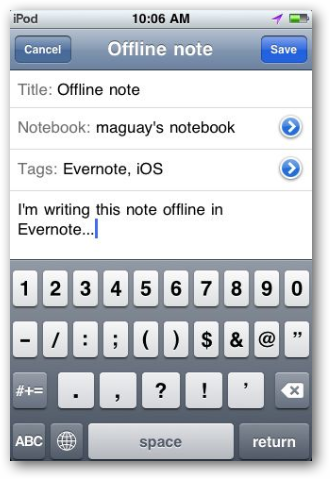 Now, when you need to access your notes offline, press the Favorites tab on the bottom. You’ll see all of your notes that you’ve market as favorites, and can view and read them anytime, even if you’re offline. In fact, you can organize your favorites as you want. Click the Edit button on the top, then drag pages to the order you want or remove them from your favorites. You can change your sync and other account settings from the Sync tab. Pro account users can select folders to sync, and those using free accounts can choose to clear the cache to save storage space on their device and see how much upload usage you still have available. If you find you’re using Evernote more and more, you may end up wanting to upgrade to a premium account anyhow. 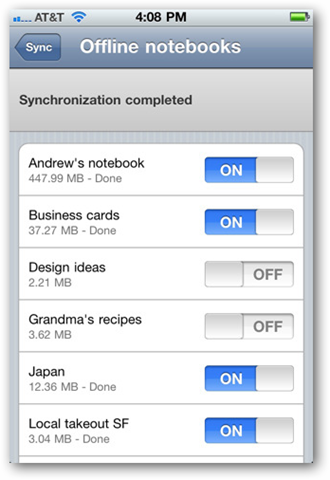 If so, you’ll be able to select your favorite notebooks to keep synced offline on your device. You’ll likely not want to sync all of your notebooks, especially if you’re limited for space on your device, so the Favorites feature may still come in handy for important notes in non-synced notebooks. Whether you’re online or offline, Evernote for iOS always makes it easy to jot down a note. 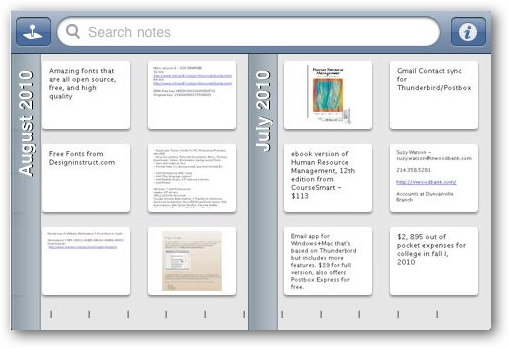 Just create a note with the content you want, and Save as normal when you’re finished. If your device is not connected to the internet, Evernote will simply save it in your device’s memory and sync it the next time you’re online. 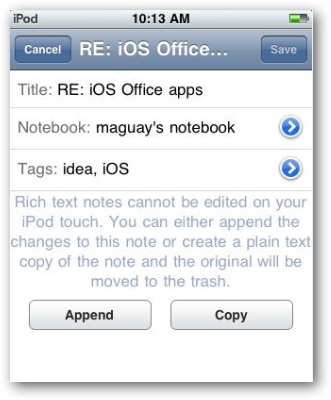 Or, if you want to edit or add information to an existing note, just edit as normal, even if you’re offline. Once you press Save, your changes will be saved to your device and will be synced when you’re online. Do note that you cannot edit rich text and complex notes on your iOS device, but you can append text onto the end of the note, which is still very useful. You’ll now see a red label on the Notes tab, and the notes that haven’t been synced yet will show up under a Pending Synchronization list in your notes. And don’t forget; if you want to make sure this note is always available offline even after its been synced, mark it as a favorite. One of the greatest advantages of Evernote over other note-taking solutions is that you can use it on a wide variety of mobile devices, desktop OSes, and via the Evernote webapp and browser extensions. If you’re using an older version of Evernote on your PC already, be sure to check out our overview of the new Evernote 4 for Windows which runs much faster and includes a beautiful new interface.